If you have kids whose eyes light up at the sight of an airplane passing by, a fire engine passing, or a sailboat in the distance, it might be time to dive into a transportation theme. 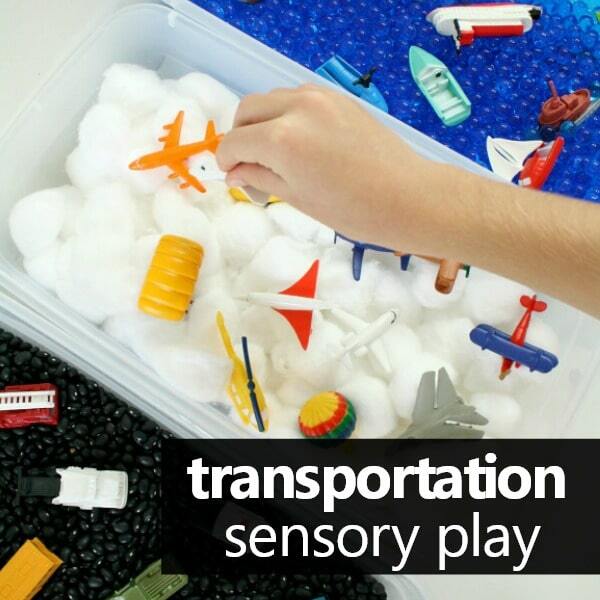 As we learned about different kinds of vehicles I set up this transportation theme sensory bin. 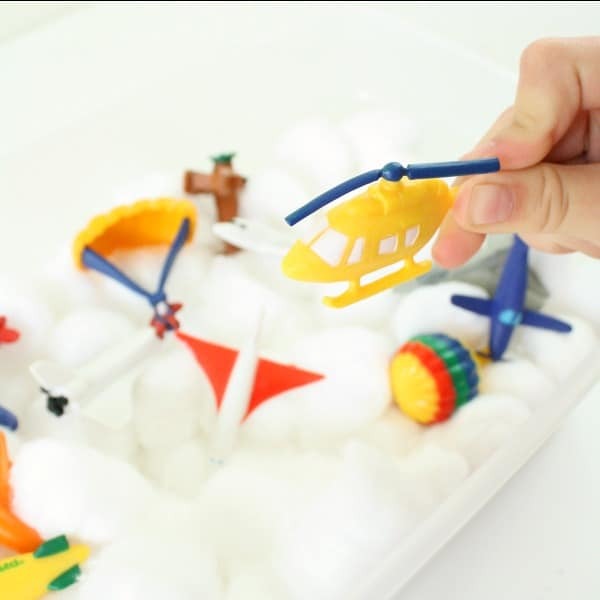 It’s a fun way for kids to think about modes of transportation and which vehicles travel by land, air and water. 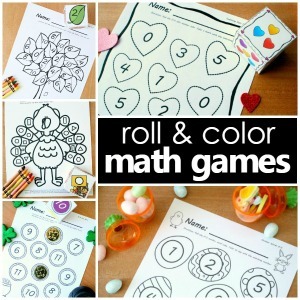 Plus, sensory activities are always a fun outlet for toddlers and preschoolers! 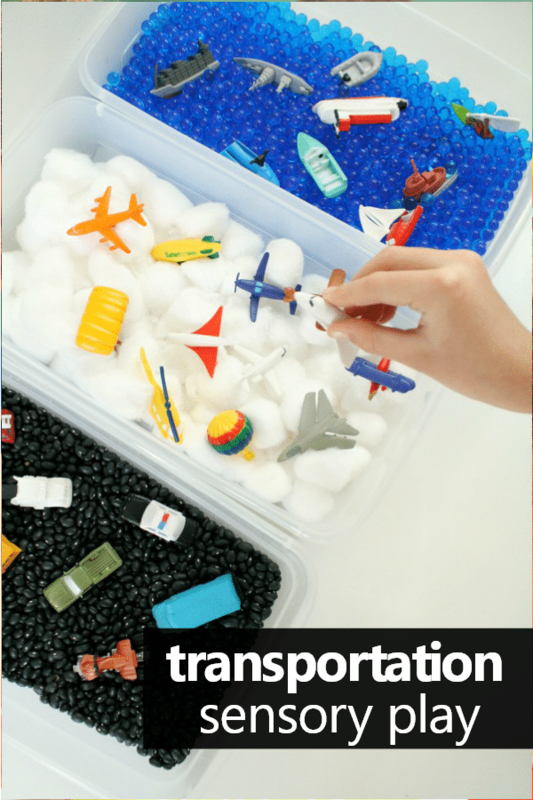 GET A FULL WEEK OF TRANSPORTATION THEME ACTIVITIES IN OUR PRESCHOOL TRANSPORTATION LESSON PLANS. I went with a simple sensory bin approach like I did for our farm theme sensory bins. It makes the bins super easy to set up, and kids love the different sensory elements in each bin. 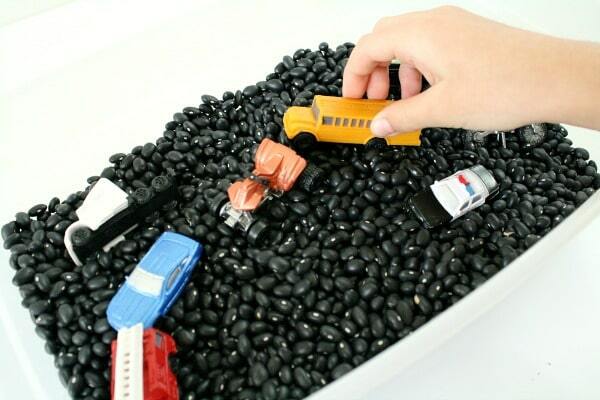 For the “land” sensory bin I used black beans as the sensory bin filler. Black aquarium gravel or small pebbles would work well, too. 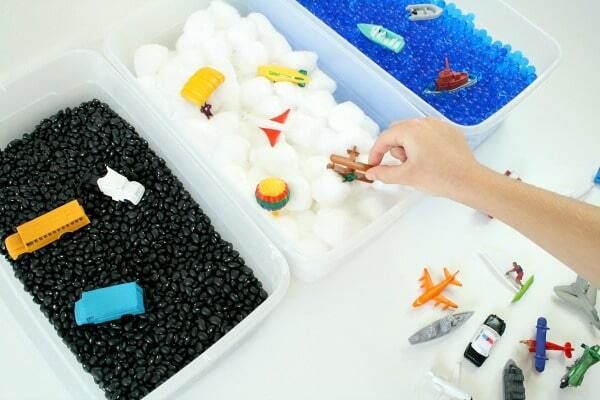 In the “air” sensory bin I added cotton balls as the fluffy clouds. 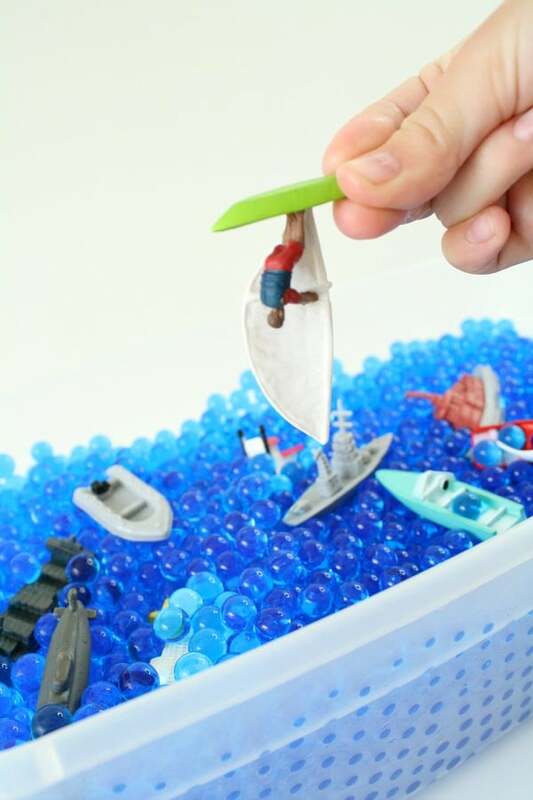 And for the “water” sensory bin I chose blue water beads. You could definitely use actual water (maybe with a hint of blue food coloring). However, the vehicles we used do not float so I wanted something that would help keep the vehicles on top of the bin. We used Safari Ltd Toob vehicles, because I love that they provide a ton of options for kids to sort! The three sets and a great book for introducing the different kinds of vehicles are included below. 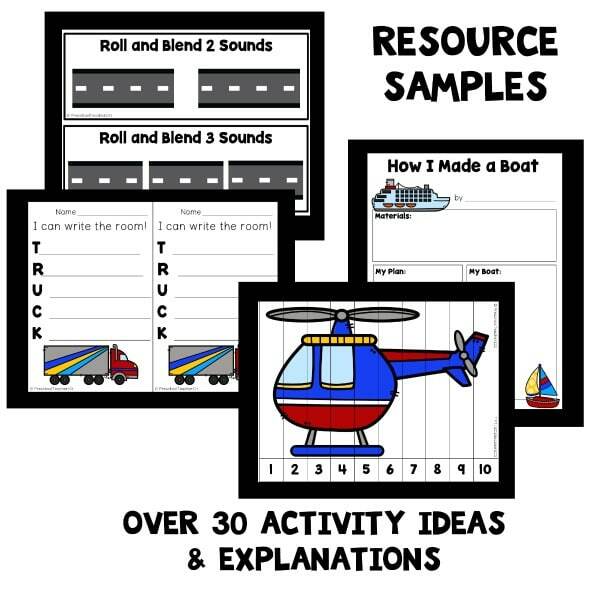 I first introduced this activity after we had some of our transportation books and the kids were a bit familiar with the different types of vehicles. We started by having the kids help each vehicle find its home (the way it primarily travels). Then it was time for free play and sensory exploration! 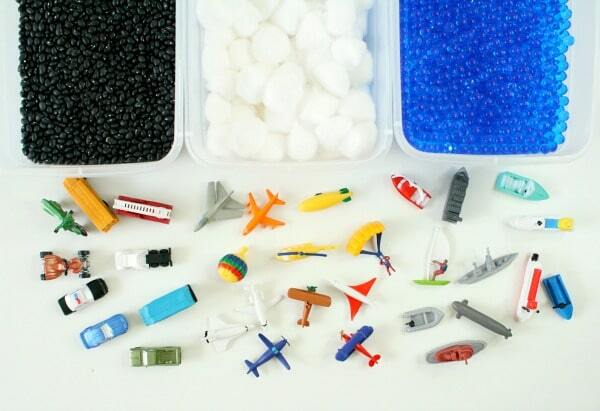 Quick tip: If you do not want kids to mix the materials in the sensory bins, discuss this beforehand. And if you aren’t sure that kids are able to resist combining the bins, then you might choose to keep the bins in separate locations around the room. As kids explore freely they’ll start to use some of the vocabulary you’ve been discussing throughout your transportation theme. They’ll also naturally begin to engage in pretend play as different vehicles swoop in to rescue and help out others. 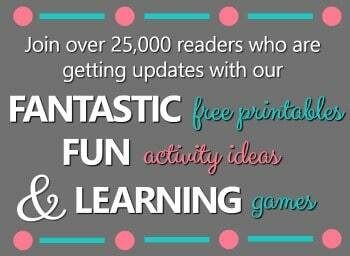 If we give kids ample time to play, their stories and pretend play scences become more and more detailed. The water bin was definitely a hit for this sensory play activity! Sailing, soaring, diving…they did it all!